@everyone Please update your wallet to the new version 2.1.0. It's a mandatory update, you must do it block 99,999 in other case the 2.1.0 will not connect to the chain. First the Qt wallet, after that the masternodes. 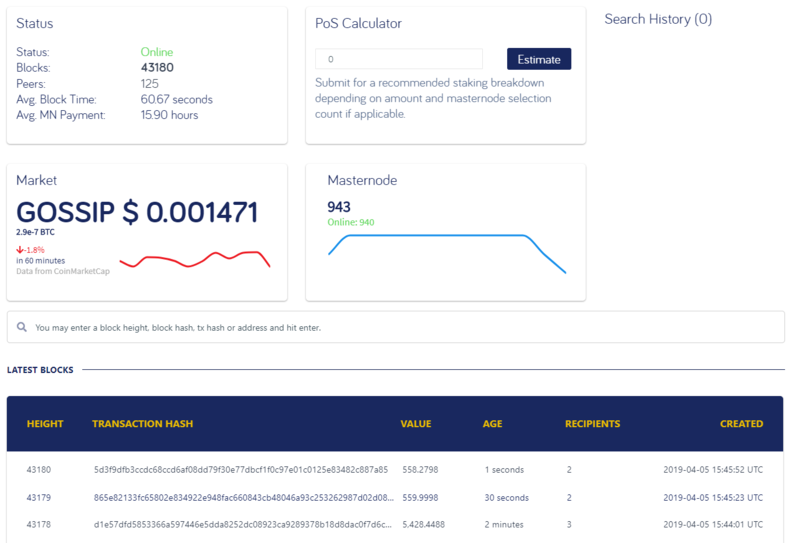 @everyone We released our dockerized multi masternode solution. You can setup multiple GOSSIP masternodes in multiple containers with one IP address. We updated our wallet to the version 2.1.0. This update is mandatory, you must update your Windows and Linux wallet's inclusive your masternodes. The version 2.0.0 will only work till block 99,999! When you installed your node with the GOSSIP script or mcarper's multi node script, the update is done in a few seconds. To update the windows wallet, you must only replace the gossip-qt.exe. @everyone Now the new BlockExplorer is https secured. @everyone Our GOSSIP PaperWallet is out! @375227325547282432> wants to share an important security message. According to recent information the last Altbet wallet has a virus that can steal coins from your other wallets if you install it locally. DO NOT INSTALL ALTBET WALLETS on the same computer as your other wallets. Because of this virus multiple shared nodes services were hacked or are still at risk to be hacked because they collocate multiple hot wallets from different coins on the same infrastructure.